Gianluigi Trovesi - One of Another Kind"
"One of Another Kind" is a tune by trumpeter Freddie Hubbard. Perhaps he meant the title as a play on words with the phrase - "One of A Kind. Either phrase is an apt description of the music of Gianluigi Trovesi - one of another kind, or, if you will, one of a kind. The implied meaning in both of these phrases is that something is different and this is another suitable word for Trovesi's music. In attempting to describe the music of Gianluigi Trovesi, the Hindu parable of the three blind men and the elephant is called to mind in which one blind man's description is based on touching the trunk; another's on touching the ears and the tusks; the third reflects his coming into contact with the body of the huge animal. Which is it? What is a description of an elephant? Obviously, it is a combination of all three and so it is with any attempt to explain Gianluigi Trovesi's body of music it must be discussed in combination because no particular or linear description of it can reveal the breadth and depth that it entails. "Gianluigi Trovesi has accomplished that most difficult of feats, not only for a jazzman, or a musician even, but for any artist. He managed to create a musical world that is instantly recognizable and completely original at the same time. Drawing upon an unlikely and personal combination of sources and, having undergone a growth process in which the usual steps in the development of a musical career were reversed, Trovesi bloomed relatively late as an artist. Yet today his voice as a composer and improviser ranks among those who created the notion of a "European Jazz" inspired by the American tradition, but not an imitation of it." As an instrumentalist, Gianluigi Trovesi is a clarinetist whose sound and technique on the instrument is the equal of Artie Shaw and Buddy DeFranco [with some minimalist Jimmy Giuffre thrown in on occasion, by way of contrast, but with an upper register!]. He also is a bass clarinetist whose sound and tone is more mature and stable than that of Eric Dolphy and an alto saxophonist with a clear, clean, crisp tone that is very reminiscent of Cannonball Adderley, Oliver Nelson or Phil Woods. "He was born in 1944 into a working-class family in Nembro, a small village in an Alpine valley not far from Bergamo in northern Italy, the young Trovesi found music around him. It was played in the common spaces of his neighborhood: the chorus for traditional mountain singing or the church choir, the guitar-accordion-clarinet trio that accompanied dances, and later the rare record and the communal listening to opera and light classical music on the first radio sets. Music was so intertwined with everyday life Trovesi didn't realize it could be a separate profession." [Martinelli]. One day, much to the young Gianluigi's surprise, a music teacher told him about the long-established Bergamo Conservatory in near-by Donizetti where people could go and learn and play music all day! Trovesi graduated with a diploma in clarinet from Bergamo in 1966 having also studied harmony, counterpoint and fugue with the renown Maestro Vittorio Fellegara. At the same time, his musical curiosity led him play in bands performing in the local dance halls where he first came into contact with the swing era arrangements of Glenn Miller and Benny Goodman. Very soon thereafter, his seemingly inherent musical inquisitiveness let him to Dizzy Gillespie and Charlie Parker's bebop, the cool school of Konitz and Mulligan and Ornette Coleman and Eric Dolphy's earliest recordings. After initial taking up employment as a music teacher in the local school system, thanks to his eclectic musical interests and to his widely acknowledged talent, including the fact that in 1978 he won the first prize in the national competition for saxophone and clarinet, Trovesi landed a permanent job in the Milan Radio Big band as first alto and first clarinet. Another factor that helped advance Trovesi's career was that around this time, he began to work in a sextet that was co-led by with guitarist Franco Cerri and pianist Giorgio Gaslini. Cerri and Gaslini were both also influential in the politically and culturally heated atmosphere of 1970s Milan. This immersion in Milan's musical milieu brought Gianluigi into contact with Michel Portal, Misha Mengelberg, Evan Parker and John Surman - all of whom broaden the range of modern music in Europe in the last two decades of the 20th century. In 1978 Trovesi began teaching saxophone and clarinet at the conservatory in Milan. In that same year, he won the first prize in the RAI TV national competition for saxophone and clarinet which helped in landing him a permanent job in the Milan RAI TV big band (he stayed until 1993). 1978 continued to be a seminal year for Gianluigi as following a concert in Bergamo with Giorgio Gaslini's Sextet, the influential European producer Joachim-Ernst Berendt called Trovesi for his Clarinet Summit production, an all-star group with clarinet soloists, John Carter, Perry Robinson, Theo Jörgensmann and Ernst Ludwig Petrowsky. "Confronted in one of these occasions with the problem of playing a solo after Evan Parker, Trovesi reached back in his memories of learned classical musician, of dance hall player and jazz improvisor, coming up with the idea to play a "saltarello" from the Florentine Renaissance school of Ars Nova [new art], developing it into an improvisation inspired at the same time by serial techniques and open Dolphy-esque harmonies." The saltarello was a lively, merry dance first mentioned in Naples during the 13th century. The music survives, but no early instructions for the actual dance are known. It was played in a fast triple meter and is named for its peculiar leaping step, after the Italian verb saltare ("to jump"). The concert was a great success and at the same time a major turning point in his career Trovesi was experimenting with basing his Jazz, not purely on American influences and schools, and free jazz, per se, but also on the Italian classic tradition, the contemporary music of the 20th Century, the brass bands, dance and night-club tunes, and the folk music of his valley in and around Nembro. "His first record as a leader, "Baghèt", is in trio, and is published in 1978, with Paolo Damiani on bass and Gianni Cazzola on drums. In it the learned classical and contemporary music, from Ars Nova to serialism, meet the Italian folk, from the Sardinian launeddas to the "baghet", a bagpipe from the Bergamo area, in a context of jazz improvisation. The record is extremely well received, and the Italian Critics Associations votes it Best Record of the Year." During the 1980's and 90's, Trovesi compiled a resume of distinguished academic, professional and creative accomplishments. Over these years, Trovesi toured extensively and performed at festivals and venues across Europe, the Middle East, India and North America with the Giorgio Gaslini Quintet, his own octet and the Italian Instabile Orchestra. He has also received many prestigious awards, such as Best Italian Musician in Musica Jazz's 1988 and 1992 competitions and Best Italian Group, awarded to his Octet in 1992 and 1996. Several of his albums were voted Best Italian Disc, including Dances (1985), From G to G (1992), an album which also garnered Down Beat magazine's highest rating of five stars, and Les Hommes Armés (1996). He has toured, recorded, and performed with countless renowned improvisers, jazz musicians, and musical experimenters, including Anthony Braxton, Misha Mengelberg, Steve Lacy, John Carter, Han Bennink, Mark Dresser, Tony Oxley, Günter Sommer, Horace Tapscott, Evan Parker, and Kenny Wheeler. Here is a select discography with annotations of Trovesi's recordings over the past twenty-five years or so to help provide a road map to the many facets of his work should the reader like to listen to his music directly. "Since recording this award-winning album, Gianluigi Trovesi has gone on to develop a body of work as strong as any on the Italian scene. Here, he performs on a range of reeds (alto and soprano saxophones, bass clarinet, and piccolo), backed by Paolo Damiani on bass and Ettore Fioravanti on percussion. As with his later work, he shows a propensity for folk and Eastern European melodies. For a largely noncommercial player identified with the avant-garde school of Italian jazz, this is a surprisingly accessible outing (although, in all fairness to Trovesi, he has always skirted between conventional and postmodern music). Damiani is given ample solo space, which he uses to great advantage, further strengthening his position as one of Europe's leading bass players. Fioravanti, too, shows some marvelous chops." Trovesi, with the help of Luciano Mirto on what can only be described as "electronics [computer operator?] and Tiziano Tononi on percussion is still finding his way, but what is important about this recording is that it helped to further establish Gianluigi as a key figure in Italy's new jazz, as performer, composer and organizer [who] continued to explore the relationship of jazz with indigenous Mediterranean culture. That issue has been largely taken up since by the splendid efforts of Peppo Spagnoli's Splasc(h) label to document the Italian scene in all its variety, and it's appropriate that the session in question appears on the label's "Italian Jazz Classics" series. Richard Cook & Brian Morton The Penguin Guide to Jazz on CD, 6th Ed. [p.1467]. By 1992, Trovesi began to put less emphasis on deconstructivist, free jazz interests and his music began to move into what Martinelli refers to as his "mature period." He forms a piano-less octet with Pino Minafra on trumpet, Rudy Migliardi on trombone, Marco Remondini who doubles on saxes and cello, the double bass team of Roberto Bonati and Marco Micheli, Vittorio Marinoni on drums on Fulvio Maras on percussion. The rhythm section of Micheli and Marinoni [a superb drummer] along with Maras on percussion would continue with Trovesi right up to his present-day group. "From G to G is a small classic. Without sacrificing any of his intensities, Trovesi has created a colorful, unpredictable, brilliant marshalling of devices drawn from jazz and beyond. While there are hints of Italian folk music and remote echoes of ancient masters of Italian composition, the synthesis leads inexorably to real Italian jazz. "Herbop" uses two theme which are split and reshaped throughout 18 minutes of music, soloists and ensemble set in perfect balance. "Now I Can" and "Herbop" are satirical without being heavy-handed and without losing an underlying severity which Trovesi uses to pare off any fat in the music. But the finest piece is probably "From G to G" itself, a long, serenely effective dirge in memory of a friend, and with a memorable solo from Minafra. The brass player turns in some of his most lucid work here. Migliardi is rumbustious on tuba and urgently expressive on trombone; but it is Trovesi himself who leads from the front, his alto solos elegantly moving forward from Dolphy to Coltrane into a sonority that again suggests the tradition of Italian song. Very fine indeed." Richard Cook & Brian Morton The Penguin Guide to Jazz on CD, 6th Ed. [p.1467]. and with its sequel in 1999 In Cerca di Cibo [ECM 543034-2]. And yet, this must the hippest clarinet accordion duo on the planet with its plethora of bebop phrases harmoniously infused into traditional Italian folk music. A gently harmonious collaboration, Trovesi sticking to clarinet, with Coscia's accordion creating a lovely harmonic undertow and rippling breakers of arpeggios that counterpoint all the reed player's lines. Some of it is cafè society, some classical rigor, some folk-tune, some dance. "Antica Mazurka" is a little of all of that, sonorously spread across eight minutes. The sequel appeared on ECM and may even be finer. "Djano, one of the great melodies in jazz, starts in muted respect and eventually takes an almost bowderlized turn. "Lucignolo" is a marvelous dance for the two instruments, and "Celebre Mazurka Alterata" is a simply gorgeous piece of music. Richard Cook & Brian Morton, The Penguin Guide to Jazz on CD, 6th Ed. [p.1467]. In 1996, Les Hommes Armès, the second major recording by Trovesi's newly formed octet is released on Soul Note [121311-2]. For all its ingenuities, this is just a degree less welcoming and appealing than its predecessor [From G to G]. Much of it revolves around the ancient European melody L'Hommes Armé, out of which came pieces by numerous composers. Five tunes Tango, Tengo, Tingo, Tongo, and T Ungo are used to interlude the big pieces, which are themselves broken up into diverse fragments; and then there's a crackpot version of "Mood Indigo" and a tribute to Eric Dolphy based on a re-harmonization of "Miss Ann." Trovesi's team play with their usual aplomb but, as delightful as it often is from moment to moment, the record never quite coheres or compels the was From G to G did." Richard Cook & Brian Morton The Penguin Guide to Jazz on CD, 6th Ed. [p.1467]. As Martinelli explains, in 1998, the strength of Trovesi's roots in his hometown are showcased in the Soul Note CD - Around Small Fairy Tales [121341-2]. Inspired from a reference in Shakespeare's A Midsummer Night's Dream to the "Bergamasque" dance [a reference that also inspired Bach and Frescobaldi, among others], Trovesi created a suite using a nontet based around three trios:  a "Jazz" trio with sax, bass and drums;  a classical string trio;  a folk trio using accordions and "tamburello" [and Italian frame drum somewhat like a tambourine]. He encapsulates all of this into the Nembro String orchestra under the leadership of Bruno Tommaso. "Wonderfully vivid and colorful music, informed by jazz but just as much in debt to the strains he associates with his birthplace of Nembro, this is fashioned somewhat as a suite, the eight pieces arranged by Bruno Tommaso to feature the orchestra alongside the rhythm section and Trovesi's own solos. Swooningly romantic is places, but usually with a hint of tartness underneath via Trovesi's own parts, this is enjoyable as soundtrack escapism or as an intelligent and highly crafted blending of consonant ingredients." Richard Cook & Brian Morton The Penguin Guide to Jazz on CD, 6th Ed. [p.1467]. Ever curious about music in different settings, in 1991 Trovesi was able to satisfy another of his interests when he was commissioned to develop big band arrangements for the WDR Big Band in Koln [Cologne]. The result of Gianluigi's efforts for this project can be heard on Dedalo [Enja 9419]. "There's a dazzling studio sound, Markus Stockhausen on hand to put in some fine trumpet solos, and outstanding rhythms from Rainey and Maras. But this is one of Trovesi's finest hours. Some of these themes - 'From G to G,' 'Dance for a King' - will be familiar from earlier records, but the invincible skills of the WDR Big Band are a great boon to such a situation: there not mavericks like the Vienna Art Orchestra, or regimentally drilled in the manner of many American big bands, but a supremely accomplished ensemble that know European music. Maybe they are less completely simpatico than the group on Around Small Fairy Tales, but this is a different kind of record. Energizing, surprising, impolite and completely entertaining." Richard Cook & Brain Morton, The Penguin Guide to Jazz on CD, 6th Ed. [pp. 1467-68]. Italian composer and clarinet master Gianluigi Trovesi has realized his own dream. For over a decade his recordings have included bits and pieces of the American jazz and blues he heard as a child and led him down the path from Bergamo to the world's jazz stages. But Fugace is different. Here, Trovesi and his octet create a veritable soundtrack to a film from the composer's imagination. They pay a great tribute to early American jazz, the kind found rolling down the streets of New Orleans in the teens and early '20s by Louis Armstrong, Sidney Bechet, Jelly Roll Morton, and W.C. Handy. But this is no New Orleans tribute album in the usual sense. Trovesi has incorporated, like his countryman Nino Rota, the traditional folk song and dance forms of Italian music and allowed them to engage early American jazz on their own terms. Tarantellas and blues make great companions (or at least they do here), from the funeral marches evoked in "African Triptych" to the places where "Ramble" and "Blues and West" evoke Armstrong's "West End Blues" in a myriad of contrapuntal exchanges between horns and the rhythm section particularly the Trovesi clarinet and the double bass of Roberto Bonati, where long, restrained folk forms grace the 12 bars and free them. There's also the elegant, minimal, slippery swing of "Clumsy Dancing of the Fat Cat Bird," where electronics, cello, guitar, and trumpet vie for the center of a mix that gives way to a hard bop read of certain passages in "St. James Infirmary." In fact, based on this track, the title, and "Canto Di Lavorno," one can feel the influence of movie directors Michelangelo Antonioni and Pier Paolo Pasolini on Trovesi, utilizing music to create the space something will take place in rather than describe the action. From restrained to rollicking to nearly classical and reverent, Fugace is a special recording. It is the most forward-thinking and easily fully realized of Trovesi's distinguished body of work. 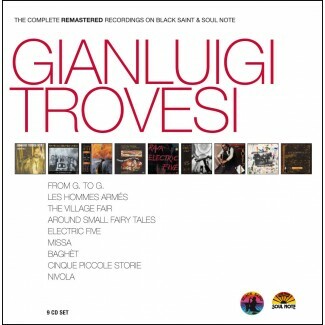 One of the more recent recordings by Gianluigi Trovesi took place in 2007 at Rome's Casa del Jazz as was issued by Palaexpo as part of its jazzitaliano live 2007 series . On this recording, Gianluigi is once again joined by his rhythm section stalwarts Marco Micheli on bass, Vittorio Marinoni on drums and Fulvio Maras on percussion and synthesizers. He is also engagingly reunited with his old friend, trumpeter Enrico Rava, who manages to add "another voice" on some of the tracks. Yet, what makes this recording so interesting is that the ever-searching Trovesi manages to completely change the sound of his music with the addition of guitarist Roberto Cecchetto who adds fresh layers of resonance to the music through the use [and, not, the overuse] of a Pat Metheny type of guitar synthesizer. This is a concert full of variety: from the easy flowing opening Canzoncina; to the bass clarinet trumpet duet that Trovesi & Rava play on Django to the accompaniment of Micheli's bass and Cecchetto's chorded guitar; or the Reggae-beat of Campanello Cammellato; the dual drumming poly-rhythms that Marinoni and Maras lay down behind a call-and-response duet between Trovesi's alto and Cecchetto's guitar on Disparietto/Siparietto; the church music, pipe organ overtones of Ricercar Vaghezza; or the Sub-Saharan 6/8 rhythms that Marinoni lays down behind Trovesi's bass clarinet on Gargantella; or the blisteringly fast Noparietto which combines elements of both Ornette Coleman and Charlie Mingus music and culminates in an awesome display of drumming by Marinoni. Trovesi's Jazzitaliano live 2007 is in many respects a perfect example of Martinelli's assertion that "He manage[s] to create a musical world that is instantly recognizable and completely original at the same time." If you haven't visited Gianluigi Trovesi's singular musical world - "one of another kind" - hopefully this piece about one of the premier musical minds of our time will encourage you to do so. Many of the recordings reviewed in this piece are available through Marco Valente's jazzos.com which has no commercial affiliation with Jazzprofiles.